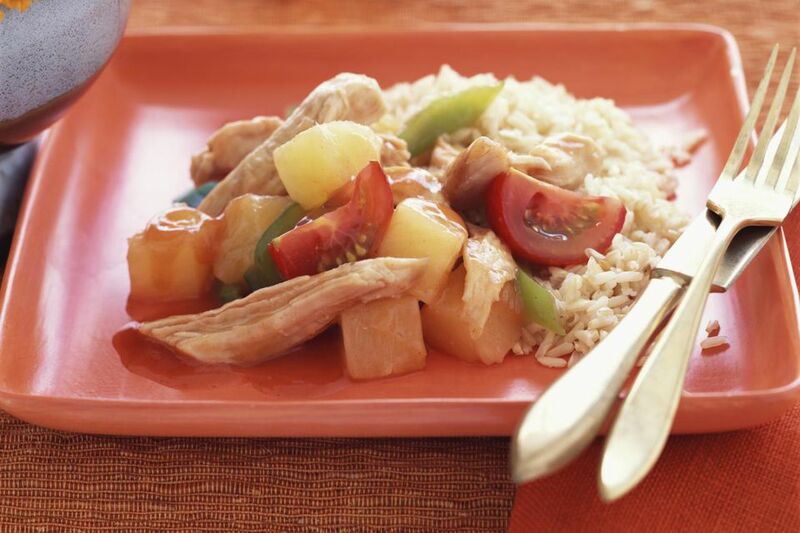 Fried chicken thighs are combined with pineapple and bell peppers in a sweet and sour sauce with pineapple juice, brown sugar and vinegar. New to Deep-frying? Check out How to Deep-fry Food Safely before you begin cooking. Pre-heat the oil for deep-frying to between 360 - 375 degrees Fahrenheit. Cut the meat from the chicken thighs into bite-sized pieces. Add the marinade ingredients to the chicken, mixing in the cornstarch last. Marinate the chicken for 15 minutes. While the chicken is marinating and the deep-fry oil is heating, prepare the vegetables and batter. To prepare the vegetables, cut the red and green bell pepper into chunks. Peel the carrot and cut into 1-inch pieces on the diagonal. Drain the pineapple and reserve 3/4 cup of juice. To prepare the batter, mix the baking powder and baking soda together well, and stir into to the other dry ingredients. Gradually add the oil. Add 1 1/4 cups of the soda, then stir in as much of the remaining 1/4 cup soda as is needed. Mix well, and add the diced green onion. Mix the chicken in the batter until it is well coated. Deep-fry the chicken. While the process is very quick, the chicken should not turn brown immediately - if it does the oil is too hot. Place the deep-fried chicken pieces on a tray lined with paper towels to drain. (Do not cover the chicken). To prepare the sauce, bring the reserved pineapple juice, vinegar, and brown sugar to a boil over high heat, stirring to dissolve the sugar. Add the carrot, green pepper, and pineapple. Bring to a boil again and add the cornstarch mixture, stirring quickly to thicken. Taste and adjust seasonings, adding salt, or more sugar or vinegar if desired. Pour the sauce over the chicken. Serve hot.